Try this nutty variation of a traditional classic Middle Eastern dessert. 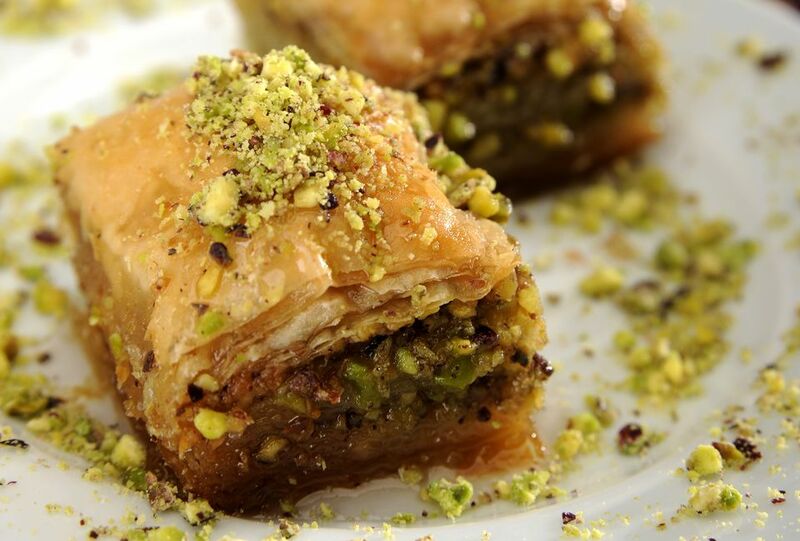 Baklava is made with layered phyllo dough, a crisp flaky dough. Preheat oven to 350 F. Butter a 15-in. x 10-in. x 1-in. baking pan. In a bowl, combine pistachio nuts and butter. Take eight sheets of phyllo dough and layer them in the pan, spreading each sheet with melted butter. Spread about half of the nut mixture over the phyllo dough and cover with a buttered sheet of phyllo dough. Layer five more sheets of phyllo dough, buttering each sheet. Add remaining nut mixture and layer with remaining sheets of phyllo dough, buttering each sheet. Using a knife, cut the baklava into 1 1/2-inch diamonds. About 30 minutes before Baklava is finished, combine sugar, honey, cinnamon, and lemon juice for glaze in a small saucepan. Bring to a boil, making sure that the sugar is completely dissolved. Reduce heat and allow the mixture to simmer for 5 minutes. When Baklava is finished cooking, drizzle syrup over top and let cool. What Christmas Foods Are Served in the Middle East?